Storytelling is how I connect. I invest in your story by finding out all I can about you, creating an environment of openness, trust and honesty. Once I know your story then I am happy to share mine. Sometimes, I have to share my story first in order to get you to share yours, but it’s a great investment because the ROI is huge and you also get ROR, which is Return on Relationship. Storytelling is applicable to all aspects of our lives because it makes us relatable, authentic and human. In today’s new leadership paradigm, the leader is someone who is capable of sharing vulnerability and sharing personal stories because we need to invest in the stories of the people we lead. One of the questions I got in a job interview was to talk about a challenge. I could have used a work-related example. Instead, I shared the ups and downs of having a mixed marriage, dealing with cultural, parental, and family gaps and how I made it a success. Instead of isolating myself, the entire panel could relate. Why? Because almost everyone has either dealt with mixed relationships or knows someone who has and we all deal with the parental gap at times. It takes courage to share, but it also shows there is so much more to me than what is on my resume. I got the job! I use Storytelling to share my business vision and mission, because I was once a ‘lost’ leader who discovered his true path of passion and purpose. I now help people find theirs. When I share this story it makes sense to people and that is the ultimate benefit of stories — it about trying to make sense of our experiences and relate it to the human condition. I use storytelling in speeches, in personal conversation and I even use them in interviews. I am not afraid to share a personal story because our lives, whether professional, academic or social, are personal to us! Know that every person has a story, a need to belong to something and create a story for themselves that is bigger than who they are. So if you invest in people’s stories and think about your own story and how it relates, you will eventually create impact, resulting in a legacy. So know your story and share it. What will your story, and your legacy, be? We’re on a mission. Our mission is to discover, develop and inspire leadership in Gen Y & Gen X.
We’re about to launch a whole new set of Vlogs this summer. But this time, we’re going to get YOU involved and share your stories too! Check this link out! When e-mail first came around, I refused to take it on. After all, I told people “Well, I’ll just visit and call people, I don’t need this e-mail to stay in touch and have my close personal friends, etc”. When I finally did take on e-mail, probably 2 years later than most, I was already behind. 4) If I wasn’t on it , eventually I was out of the loop or it was harder to stay in the loop. So when Facebook and other social media connection sites showed up, the same principles applied and I became an early adopter. Now the challenge is that there is so much out there andso much fragmentation (including texts and mobile) of communication and connection points, so you have to pick and choose how in or out you want to be. When I announced the birth of my son Nyal, I e-mailed everyone and shared on Facebook. When my daughter Ryah was born I only posted on Facebook and soon found out most didn’t know. The only way for me to reach everyone was to do everything. Whether it was the Internet, E-mails, Napster, MSN messenger, Facebook, Twitter, cells, smartphones, and text messages, it ultimately comes down to how you want to connect, who you want to connect and which connections matter. But the most important question is Why. This article sums up very nicely. The truth is, we all long for and need connection, to share our lives and engage in others lives. 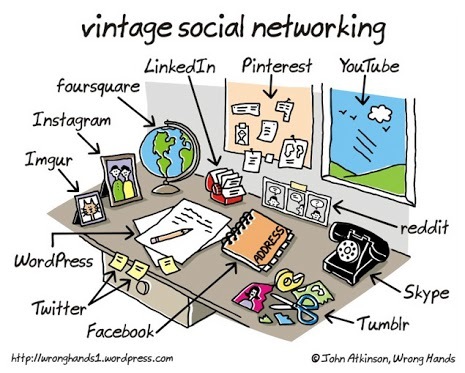 For now social networking is the best way for us to realize it.